I tend toward being a perfectionist, and it's very noticeable when I'm knitting. A lot of knitters, upon making a small mistake in their project, will simply fudge a correction (maybe they accidentally added an extra stitch along the way and will just knit two together when they discover it) and move on, saying that most people don't get close enough to your work to see the mistakes, and they are absolutely right. 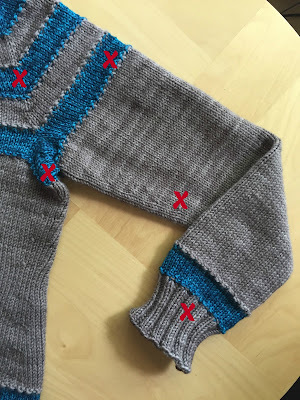 But much as I've tried to let things go in my knitting, I can't, and I end up tinking back (unknitting) to the mistake and making the correction. A mistake in my knitting bothers me. I know the error is there. I see it. The sweater that I'm currently knitting? If you added up all of the rows I've knitted, unknitted, and then reknitted, I probably could have made a baby sweater as well as this adult-sized one. Some of this was due to confusion from the way the pattern was written, some of it was due to me not counting my rows correctly, and some was me not noticing that I needed to switch to a smaller needle size. Long and short of it is, I have spent a lot of extra time on this sweater to make it perfect, because that's what I want. I am a perfectionist with my knitting, and I make no apologies about it; when I'm finished with a project, that's it - there's no going back to correct a mistake later on, so I need to get it right. This is permanent perfection. In other things, though, I'm not so rigid when it comes to perfectionism, and the most obvious one is my eating. I wasn't always like this - I used to be an "all or nothing" person, which is why I was such a diet failure for so long...one mishap and I would throw in the towel, give up the diet, and stay overweight. However, the last time I started dieting, I was really good about tracking my food, and I made myself track everything, every day - good and bad. Doing that helped me to see that even when I thought I went off the rails, it really wasn't that awful, and certainly not worth giving up on my diet. Keeping this in mind, I've adopted a temporary perfectionism ideal when it comes to dieting and/or maintenance. For example, last week I'd been on a roll with three on-point eating days, when I came home after having dinner out with a friend (we had salads). Jeff met me as I walked in the house and said "ice cream?" which I knew meant Dairy Queen. Now, a small cone wouldn't have been the worst thing in the world, but I wanted to finish up that day without going off track, so I said I'd rather have it the next day, and that's what we did. Finally realizing that there are two kinds of perfection, and that both are working for me, has brought me a sense of peace - being able to let go of permanent perfection with all things has meant that I could concentrate on the stuff that I have a better chance of succeeding with, while allowing myself the temporary perfection of not always getting it right with eating, and still being OK enough with it that I no longer give up. I can appreciate this because I am a "type A" person when it comes to some things, yet there are other things I could care less about! Can you imagine being type A about everything? That would be a hard life, I suspect. Very good post. I have tended to be an all or nothing girl and I've had to recently learn in my weight loss efforts that sometimes just hanging on for the ride and not worrying about perfection is a victory! I'm hanging on for dear life some days, LOL!! I think you are very hard on your knitting especially for it being your first sweater! Finding that balance with food in maintenance is just as hard as weight loss at least for me it is. Good job on finding your balance on your maintenance. I'm definitely not a perfectionist in my eating, but i'm like you with my projects. I want it right - especially if it is going to be something I'm going to be looking at over time. There's pride in getting it right. I agree - pride, even if no one else notices. Right there with you on the different levels of perfection--I let some things go (like my house) but not other things, like fitness and work! It's all a balancing act, isn't it? I used to be a perfectionist, but I think I'm not any more. You are so right that it is a very good trait to NOT be a perfectionist in our weight loss efforts. As far as the knitting….I think I was always one of those who knew how to "cheat the system." Your sweater is looking so gorgeous!! I can hardly wait to see the whole thing. I had a hard time figuring out how to correct my mistakes in the beginning, so that's why I just unknit everything...and now I just accept that as part of my process, LOL. That was written perfectly Shelley - I too was an all or nothing - and one slip off the rails as you put it, I could stay off the rails for days, weeks, months even! and p.s. I am jealous of your knitting skillz! I used to be all or nothing like that about food too! Oh, I just fell off the diet wagon, so now that I've failed, I'd better keep on gorging and STOP DIETING COMPLETELY. It makes no sense. Tracking helped me with that a lot too, as did seeing results week after week, even if I did occasionally splurge and get a little off track. A small mis-step here or there doesn't really make a difference in the big picture (thankfully!). Exactly! But it sure is hard to convince yourself that you haven't ruined everything with one off-kilter day of eating. That sweater is going to be so striking. Thought provoking topic. Quilting has made me learn to find a balance between perfectionism and enjoying what is a hobby to me. 1/4 inch off, un-sew. 1/16th inch, maybe not ... especially if I've tried more than once. Perfectionism in losing weight doesn't work for me either ... managing weight is too long term. Persistence is the more valuable PER word. Very good points, Jeannie. And it's interesting what your tolerance level is when it comes to quilting...I totally get that. That is an awesome place to be in with your eating! I think a lot of people have the all or nothing mentality which is why they have such a hard time eating well - it has to be 100% of the time! I am not a perfectionist AT ALL but I am like you with knitting. I've completely unraveled projects to fix something! It bugs me to know the mistake is there! LOL! See, good to know it's not just me when it comes to unraveling knitting projects! I love reading your blog and have been following you for some time. Your weight loss posts are outstanding and I am so excited to see knitting posts as well. When I was 10 my aunt taught me how to knit and I made my first sweater - a yellow pullover. Every day during the summer my dad dropped me at my aunt's house and I sat and knit all day. When I was done, it came out long, long, long - way too long. My aunt appropriately told me that I had to tear it all out and re-do. My father had a fit - he said "just roll up the excess and carry pencils in it"! Needless to say I tore it out and remade it and my aunt pronounced it perfect. That was 57 years ago and I still remember it. I can't remember the number of sweaters that I made myself but there were plenty as well as children's sweaters for my goddaughters. BUT I have never used circular needles and I note that your knitting appears to be on circular needles. Is that the "modern way" of knitting now? When my aunt passed away her son gifted me with all her needles - every size imaginable, metal and wooden as well as DP needles and cable holders. No circular ones, though! I love your first sweater story, Cheryl - and wow, I'm just so impressed that you took on such a big project at such a young age. Probably too young to realize how big it was? Very cool that you made it perfect - I'm sure you learned so much with it. I was taught to knit with circular needles, and I much prefer them to straights as I feel like I have less needle to hold...most of the work goes on the cable between the needles, and that takes the weight off of the needles and thus off of my hands. It's pretty much all I know, but I do think that circs are more of a modern way of knitting (and much more widely available now). Ooooh I'm a perfectionist to the core and one of the gifts of midlife to me is getting over that in many areas. I'm finding room to be a bit more flexible, and truth be told, I'm happier because of it! You've almost described how I've been eating since I went on my $5 quest. I'm just eating the same foods and when it comes to extras, I often just tell myself I don't need it today but I surely can have it another day. It is helping me make peace with food and though I'm losing weight certainly doesn't feel like any of the many diets I tried over the years. Allowing yourself to be imperfect in some things is a relief, isn't it? I just got back from vacation and am catching up on blogs, started with the oldest. It might take a couple of days before I have catched up on your blog.